a spherical bacterium, usually slightly less than 1 μ in diameter, belonging to the Micrococcaceae family. It is one of the three basic forms of bacteria, the other two being bacillus (rod-shaped) and spirillum (spiral-shaped). A pathogenic coccus can almost always be classified as either a staphylococcus (occurring in clusters), or a streptococcus (occurring in short or long chains). Both staphylococci and streptococci are gram-positive and do not form spores. The staphylococci are responsible for many serious infections, especially Staphylococcus aureus, which is the causative agent in boils, abscesses, osteomyelitis, and a large variety of other infections. Staphylococci have received much attention in recent years because of the ability of most strains to develop a resistance to antibiotics. The most dangerous streptococci are those of the beta-hemolytic type. 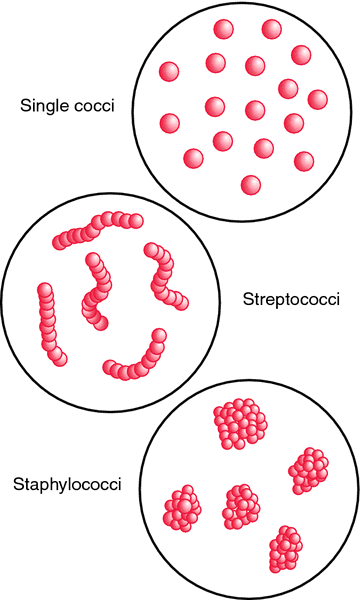 Various species of streptococci cause sore throat, scarlet fever, mastoiditis, and septicemia. (kok'ŭs, kok'sī), Avoid mispronouncing the plural form kok'ī. 1. A bacterium of round, spheroid, or ovoid form. A bacterium having a spherical or spheroidal shape. a bacterium that is round, spheric, or oval, such as gonococcus, pneumococcus, staphylococcus, and streptococcus. coccal, adj. A common type of spherical or spheroidal bacterium. Cocci connected in line are called STREPTOCOCCI; those in bunches are called STAPHYLOCOCCI. a bacterium having a spherical or globular form. A bacterium of round, spheroid, or ovoid form. pl. cocci [L.] a spherical bacterium, usually slightly less than 1 μm in diameter, belonging to the Micrococcaceae family. It is one of the three basic forms of bacteria, the other two being bacillus (rod-shaped) and spirillum (spiral-shaped). Almost all of the pathogenic cocci are either staphylococci, which occur in clusters, or streptococci, which occur in short or long chains. Both staphylococci and streptococci are gram-positive and do not form spores.